American songwriter Desmond Child’s piece Steps of Champions should have been a major media coup for Hungary’s Orbán government. After all, Desmond Child–an American-Hungarian dual citizen who had worked with music legends such as Bon Jovi, Aerosmith, Cher, Bonnie Tyler, Ricky Martin and Kiss–had been successfully enlisted by Hungary’s government to write the official anthem of the sixtieth anniversary commemorations of the 1956 Hungarian Revolution. Yet what should have been a victory and a positive media story for the Orbán government is now the source of derision, mockery and fury, as it transpired that the song passed off as an original piece honouring the heroes of the singularly bloody 1956 Hungarian revolution was actually nothing more than a recycled song, used before in Miami nine years ago, at a sports event. In a blatant attempt to misled the public, the Hungarian government spent US$ 183,000 on this recycled Desmond Child song, which has absolutely nothing to do with Hungary. 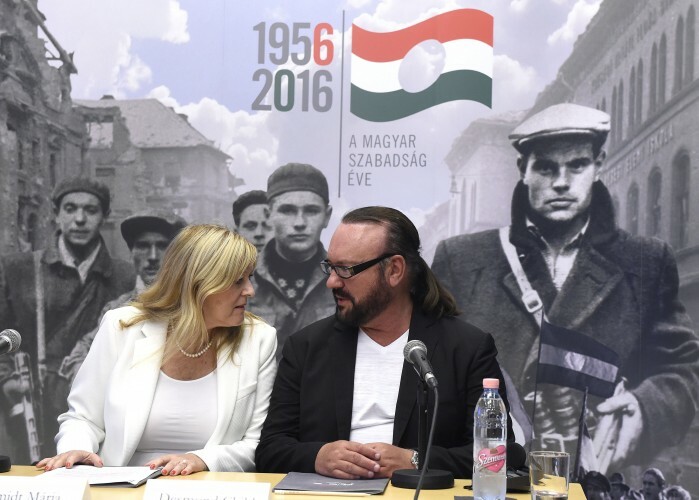 Mária Schmidt (left) with Desmond Child (right) at the Budapest House of Terror. Photo: MTI. Mr. Child recounted how he had the chance to meet Prime Minister Viktor Orbán in Washington, DC. Mr. Orbán had apparently personally asked the American songwriter to produce a special song for the 1956 anniversary. Gábor Tallai, the House of Terror’s Program Director, remarked exuberantly: “Songs, by virtue of their ancient sacred purpose are meant to connect hearts,” suggesting that Mr. Child’s piece would help unite Hungarians ahead of major commemorations beginning this fall. That’s not how things worked out, when journalists at the liberal 444.hu website discovered that the song that Prime Minister Orbán had allegedly commissioned and which ended up costing Hungarian taxpayers 50 million forints (US$183,000) to produce, was nothing more than a nine year old tune already used in Miami to celebrate American athletes. To make matters worse, the Hungarian media had a field day with the fact that the song’s refrain is difficult to understand. Nearly everyone (including the author of this piece) thought that it declared that “Hungary smells like fish” (Magyarország halszagú), rather than “Hungary, hear our voice” (Magyarország, halld szavunk“). It is indicative of how Hungarians feel–including many on the right–that on YouTube, at the time of writing this piece, the song received over three thousand dislikes and just five hundred likes. Indeed, the 1956 Hungarian Revolution and its repression was a truly brutal event and ultimately a tragedy. An estimated 5,000 people were killed on all sides. Some 350 revolutionaries were executed following the repressed revolt and 13,000 were imprisoned. More than 200,000 Hungarians (or 2% of the population) fled the country, making this one of the most serious refugee crises in international history. I have granted the license to use this composition to the Hungarian state completely free of charge and as a patriotic courtesy. 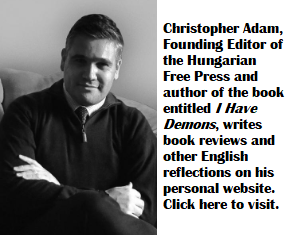 The Hungarian state therefore only covers the direct recording costs incurred in producing this work. For this reason I’m extremely surprised and disappointed how a part of the Hungarian media has launched a full-blown and unworthy attack against the project, my person and my family life. I feel especially hurt that they would politicize even this sincere tribute to the 1956 Hungarian Revolution which lives forever in our history to promote their own current agendas. History is happening right now and this is the moment, at least for this, to put aside all of our disagreements and walk together hand in hand in the steps of champions. The question should really be… is the song great? Does it bring out the patriotic feeling in the hearts of all Hungarians that honors those who gave their lives and fought for the freedom we enjoy now and should never take for granted. The answer is in the tears of the eyes of every Hungarian I’ve played it for. Actually, the question for journalists should be how Viktor Orbán’s government spent US$ 183,000 in public funds if they did not pay for an original song to be written, nor any licencing fees for an existing song, and also why the government attempted to mislead the public into thinking that they were getting an original piece for this amount? As the conservative Magyar Nemzet daily pointed out, this is not the first time that the ruling Fidesz party turns a national anniversary into an embarrassment. In the year 2000–when the first Orbán government (1998 to 2002) celebrated the founding of the Hungarian state one thousand years earlier–their fireworks display turned into a veritable disaster. András Wermer, Prime Minister Orbán’s adviser, bought heavily discounted, left-over pyrotechnic supplies used by McDonald’s in the United States. When Hungarians looked up to the skies above Budapest, as the nation solemnly commemorated the founding of Hungary by King Stephen, the fireworks display included the shape of a massive hamburger above the capital. Prime Minister Orbán’s adviser and his private company, ominously named “Happy End,” reportedly pocketed 230 million forints ($1.3 million) in public funds for its role in coordinating the Big Mac fireworks display. You could not make this up. Shame on Orban . The emperor has no clothes. Storm in a teacup some lefties can j*rk off at…. having nothing better…. I am not interested in how much money the Orban government spends, rather in whose money is that and where it came from, and how much left for the lives of the Hungarians. Let me post one of my favorite song, that is not a hymn but about God, and about how great it is when God is on our side when we fight enemies. Beautiful song, too. – Used blatant lies (title on CD “For a Free Country” while they destroyed the Hungarian).